Although some of the items pictured in these Profiles are or have been for sale, the purpose of this section is educational: to provide illustrations and information for the collector. Of course, many brands and models have not been profiled as yet. If you cannot find what you are seeking here, you may wish to try our Search page. 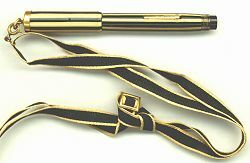 More can also be found at our Vintage Pen News blog. Reference book recommendations are listed here. For original instruction sheets, see Filling Instructions. We are constantly updating and adding to this section, so do come back often. Suggestions and specific requests are welcome!